When it comes to their archiving, CAD models are very different from Office files. However, many businesses assume that Office files are upwardly compatible, and can still be read, edited and issued after every future version release. That’s not always the case. 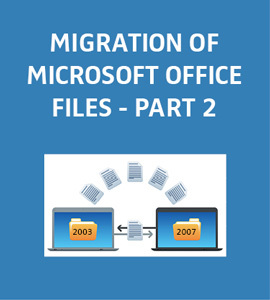 In this two-part series we’ll show you what you need to know if you wish to efficiently migrate your data from Microsoft Office 2003 (or earlier) to Office 2007 (or later). Today we’ll explain whether compatibility mode can serve as a solution, and show you how to set up and automate the ideal migration process. Beginning with Version 2007, the MS Office Suite includes a compatibility mode. This converts files in older formats to the new XML format on the fly. The user must decide whether to save the document in the old binary format, or in the resulting XML conversion. Here there will often be warnings about incompatibilities when saving files. Version 2003 also contains a compatibility mode which temporarily reverts the XML-based files of the newer Office versions back to the old binary format before saving. This, however, comes with the same weaknesses and, through the conversion of more developed formats to an older format, tends to cause more problems that it solves. Using compatibility mode alone carries its own risks. Does the software always precisely differentiate between the file versions? Does a separate interpreter for old formats really always read files exactly, or does it carry out an approximate emulation for some elements? Tangible incidents urge for caution. The question arises: Is the compatibility mode always present, even in later Office versions? Even Microsoft notes that not all elements used in Office can be transferred from one Office format to another without changes to the visual reproduction. Here it is clear that a controlled file migration – as is usual in CAD – makes a lot of sense. With the update of a workstation computer to Office 2007 or 2010, the existing database is transferred to the new file format with an automatic conversion process, under the supervision of experts, instead of accessing the Office 2003 files with the new Office versions over the compatibility mode (“compatibility pack“). In summary, this means: business-critical documents should only be converted in the course of the complete or partial controlled introduction of new Office versions. Data which can be safely converted into the new format, without discrepancies. Data which contains elements which cannot be converted into the new format without manual assistance. In the tests, the functions are also examined and evaluated for macros and VBA scripts in the new Office runtime environment. Controlled data migration: designing and automating the ideal process. SEAL Systems offers the ideal solution for carrying out the ideal data migration process (that means fast, secure and efficient). With the Digital Process Factory (DPF) from SEAL Systems, automatic, complete migration processes are configured easily by analysis/classification (per OMPM) over classification, sorting out, notifications and conversion. The Digital Process Factory is a development and runtime environment for the drafting and flow control of IT processes in the processing of information, data, files and documents.DPF is highly efficient for the design of customer-specific flows and processes, because programming is replaced by the configuring of standard processes. The principle: elementary, standardized process components — the working units — are compiled in variable processing sequences. There are interactive, user-intuitive tools for assembly and flow control. For Office documents managed in SAP DMS, there is even a standard solution from SEAL Systems called DMS-XSA (Extended Search&Action), which can be integrated into the automation process. You’ll find all information for later perusal in this white paper on office refiling.